The curtain came down on Zanu PF primary elections yesterday which were held peacefully countrywide, while some provinces are in the process of collating and tabulating results. Bulawayo and Masvingo provinces were through with voting by midday yesterday, while in Masvingo Province vote-counting was underway by end of the day. However, in some constituencies such as Harare South, voting was still underway yesterday evening due to the late delivery of voting material. There were some constituencies that will have to wait for a determination from party headquarters after voting failed to kick-off. For the first time, the internal polls are being held under the auspices of newlyformed organ of the party — the National Elections Commission (NEC) — and as a result, there have been some teething challenges. In an interview yesterday, NEC chairperson Lieutenant-General Engelbert Rugeje (Retired) said voting, which was officially scheduled to end by 6pm yesterday, was peaceful across the country. He said the party had put in place “corrective measures to deal with the anomalies” that could have been experienced during the elections. NEC will accept appeals from aspiring candidates and party cadres, he said. “The exercise we extended officially ends today (yesterday) at 6pm,” said Lt-Gen Rugeje. “Most provinces are through with voting. Of course, there are some few areas which might have issues, but it cannot be an endless process. Despite the teething challenges, he said, the internal polls were democratic. “Of course, we have challenges in some areas where ballot papers were not delivered on time and some are saying their names were not on the ballot papers as candidates, while some were saying their names were not appearing on the cell registers,” said Lt Gen Rugeje (Rtd). Lt Gen Rugeje (Rtd) said the party had adequately prepared for candidates who wanted to “cut corners” and those “who wanted to smuggle themselves in”. In Masvingo, collation of final results had begun at various district election command centres in the province. There were, however, voting delays in parts of Masvingo Urban, Chiredzi West and Gutu West because of alleged anomalies with regards to cell registers. Counting and collation of votes was expected to start in most areas around 6pm yesterday, as ballot boxes from some areas that had finished voting were being moved to district command centres in the afternoon. There were fears vote counting could be affected by poor lighting in some parts of Mwenezi. Zanu-PF Masvingo provincial chairperson Cde Ezra Chadzamira said voting had gone on well across the province despite some isolated challenges. There are several interesting constituencies in the province where bigwigs are battling to represent the revolutionary party, especially in House of Assembly elections. In Chivi Central, Politburo member Cde Munyaradzi Paul Mangwana is facing five other candidates, including Colonel Manasa Mahapa (Retired), while provincial chair Cde Chadzamira is being challenged by Western Ezrah in Masvingo West. Youth League secretary Cde Pupurayi Togarepi is involved in a gladiator contest with Ambassador Jonathan Wutawunashe and Cde Kalisto Jokonya in Gutu West. 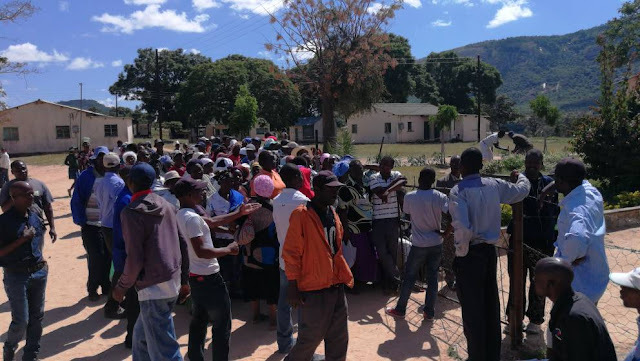 There were reported challenges with the cell registers in Dangamvura-Chikanga constituency in Mutare, where eight candidates are vying for the seat. In Makoni Central, where Finance and Economic Development Minister Patrick Chinamasa is facing off with one other candidate, voting was still underway by 6pm yesterday. Similarly, in Mashonaland Central, despite the hitches experienced on Sunday, voting had progressed relatively well by end of the day yesterday. But there were challenges which forced the postponement of some elections, particularly in Mashonaland West, where elections could not proceed in Zvimba North over allegations of ballot tampering by some contestants. Cde Mariam Chombo and 13 other candidates are seeking a mandate to represent the party in the House of Assembly elections for Zvimba North. Cde Sydney Nyanungo, a representative of the NEC in the province, said the outstanding issues will be dealt with as a matter of urgency. In Harare, voting had begun by mid-day in most constituencies. However, challenges were experienced in Harare South, as most areas had not received ballot papers by 7pm yesterday. Zimbabwe National Liberation War Veterans Association (ZNLWA) spokesperson Cde Douglas Mahiya headlines the list of 11 candidates that are eyeing the Harare South seat. There were mop-up exercises in Mbare and Glen View South. Lt-Gen Rugeje (Rtd) was confident that voting would be completed yesterday. “Voting should end today (yesterday) whether places got material or not,” he said. “We will then make the neccessary announcement tomorrow on way forward, particularly those areas which failed to vote because of those logistical challenges.